An area of low pressure developing in the Pacific Northwest will bring snow to the region through Saturday. Snow is expected through Sunday across the Sierra Nevadas. Elevated winds and seas will continue across the Gulf of Mexico through Sunday afternoon as a cold front moves eastward. An area of low pressure is expected to develop across the Pacific Northwest throughout the day today. This system is expected to move southward through the weekend, producing snow across the region. 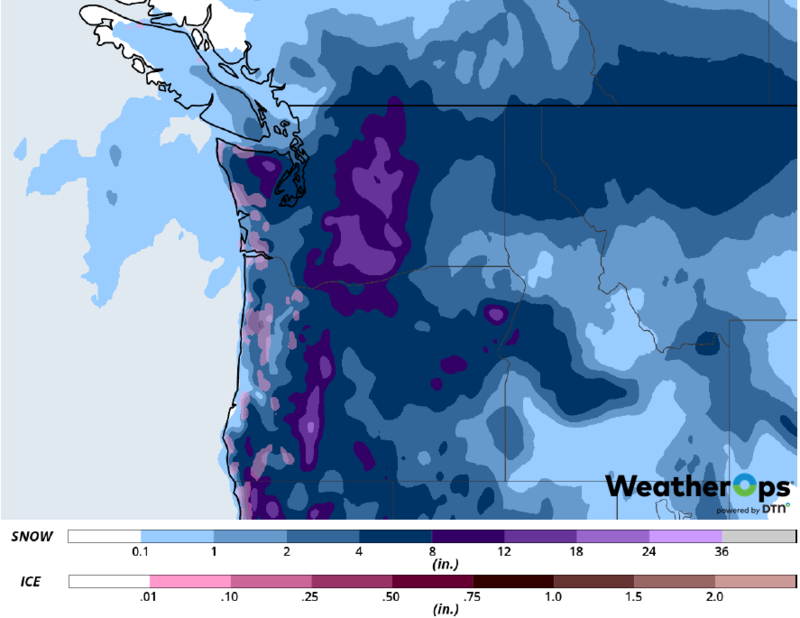 In Seattle, snowfall totals will range 4-6 inches with higher amounts in excess of 8 inches in the mountains. Further to the south, 2-3 inches are expected. Wind gusts around 20-25 mph are forecast, leading to blowing snow and low wind chills. By the afternoon or evening on Saturday, the low is expected to move into the Rockies. 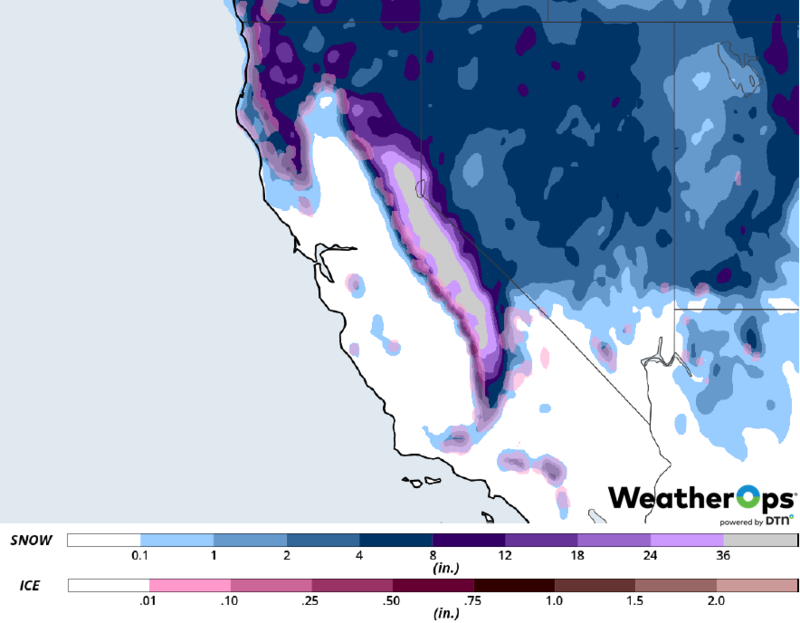 A significant winter weather event is forecast for the Sierra Nevadas beginning today and continuing into the weekend. As an area of low pressure moves along the West Coast, onshore flow will lead to lift along the western edge, producing heavy snow. Winds will increase with wind gusts in excess of 50 mph. Snow accumulations will range 20-30 inches with locally higher amounts in excess of 3 feet. A cold front is continuing to move eastward across the Gulf of Mexico, producing elevated winds and seas. 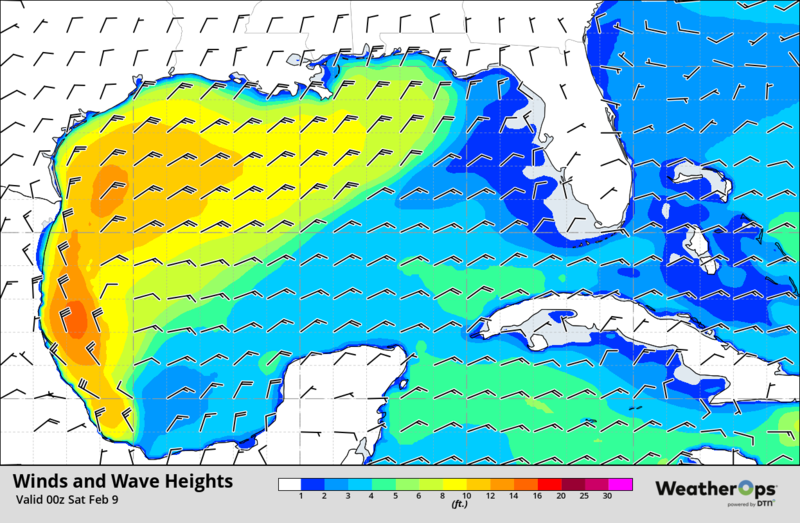 Winds behind the front will be northeasterly to north-northeasterly at 25-30 knots with gusts in excess of 40 knots. Ahead of the front, winds will be south-southeasterly at 5-10 knots. Seas will be 3-6 feet near the shore and 7-13 feet in the deeper waters. Snow is forecast across the Northern Plains on Monday as an area of low pressure moves into the region. The snow will move into the Upper Midwest and Great Lakes on Tuesday. Light freezing rain may develop across eastern Iowa into the southern Great Lakes. As the low moves northeastward, snow will continue across the Great Lakes on Wednesday. Light snow may develop on Thursday across the Central Plains.